Register online with your RCBC Bankard JCB Platinum HERE. The promo is open to all Principal and Supplementary RCBC Bankard JCB Platinum cardholders whose accounts are active and in good credit standing. 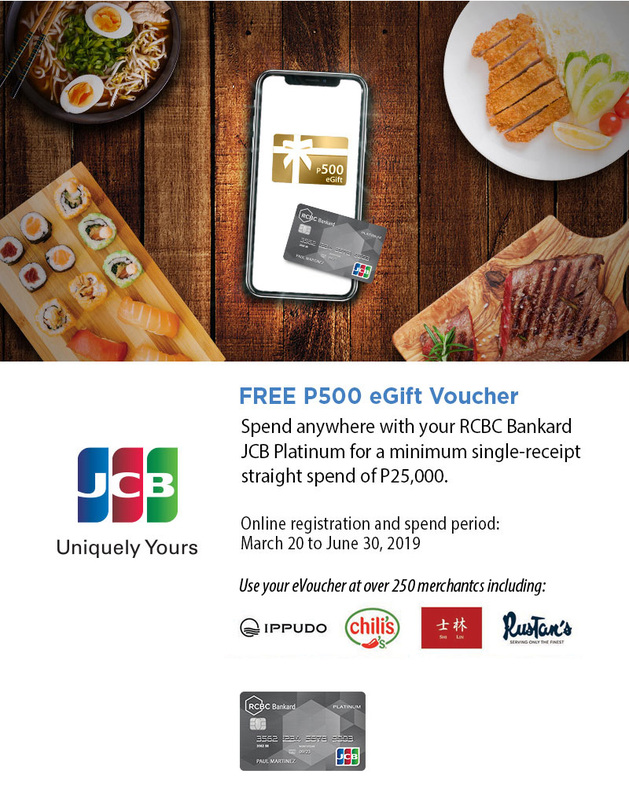 Qualified RCBC Bankard JCB Platinum cardholders must use their card within the promo period and make a minimum single-receipt straight purchase of Php25,000 and up ANYWHERE, including overseas and online. The following transactions are excluded from the promo: Installment, Balance Conversion, Cash Advance, CHARGE, Balance Transfer, Cash Loan, and Your Cash. To qualify, the RCBC Bankard JCB Platinum cardholder must register online at https://www.rcbcbankard.com/jcb-gift-form and provide the following information: Card embossed name and the First 8 and last 4 digits of his/her card. Online registration and spend period is from March 20 to June 30, 2019. Redemption period is from April 15 to September 30, 2019. For each qualified transaction, the cardholder can redeem one (1) Php500 worth of eGift Voucher. The eGift Voucher is accepted at over 250 merchants or 3,400+ locations nationwide. Transactions of the Principal and of the Supplementary cardholder will not be combined. Only the transactions of the Principal cardholder will be qualified for the promo. All posted retail and installment transactions in pesos and in other currencies are qualified for the promo including online transactions, mail order/telephone orders and recurring payments or bills payment transactions. Excluded are the following transactions: (1) cash advances via ATM or over the counter, (2) transactions coming from casinos or gambling establishments, (3) Balance Conversion, (4) Balance Transfer, (5) Cash Loans. For transactions in foreign currencies, RCBC Bankard will follow the foreign exchange rate conversion at the time the transactions were posted on RCBC Bankard’s system. The cardholder will be charged the cost of the eGift Voucher should the cardholder cancel the qualifying purchase used to redeem the e-GC or if the credit card transaction is found to be fraudulent. In case of cardholder disputes regarding the promo mechanics, RCBC Bankard Services Corporation’s decision shall prevail in concurrence with DTI. The promo is subject to the Terms and Conditions governing the issuance and use of RCBC Bankard Credit Card. Redemption period is from April 15 to September 30, 2019. Account must be active and current at the time of redemption – no past due. Incomplete/incorrect information in the redemption form will not be processed. RCBC Bankard will not be responsible for unprocessed redemption due to incorrect encoding of information in the submitted redemption form. Cardholders will be notified of the result of validation through SMS within 15 working days from date of online redemption. For valid redemption, the SMS confirmation will include the eGift Voucher code, link to redemption stores or merchants nationwide and expiry date. To make use of the eGift Voucher, the cardholder must present his/her RCBC Bankard JCB Platinum card, a valid ID and the unique Universal eGift Voucher code sent via SMS at his/her preferred participating store/merchant. The eGift Voucher must be fully consumed at the time of redemption. The eGift Voucher is non-convertible to cash or rewards points, and not for sale.